Sun Spots – I’m also researching some options with IPL and laser removal of these pesky spots I’ve gotten over the years. Asian skin is just more prone to hyperpigmentation – ugh. First step – I’ve been using these Neogen cleansing pads in the morning and I highly recommend them! It’s basically a scrubby pad with two sides – a softer side and an exfoliating side. It’s really easy to use in the morning and smells great. The way you use it is just slipping it over your fingers and swipe it over your face to gently clean and buff away at the skin. I have the purple one which smells like grape, or wine as it indicates on the packaging. I like to concentrate around my nose, lips, and chin to to get rid of excess dead skin in this area. Next, I apply an essence to my skin – this is the Tatcha Essence, which is meant to soften and plump the skin with deep hydration and prepare the skin for the next steps of your skincare routine. I pour a little into my hands, and gently pat into my skin and let it absorb. 3 – Cant forget about my lips, which is always dry. To prevent them from flaking, I apply Aquaphor which protects it against this dry Vegas air. 4- Moving on to my morning serums and treatments. To address my dark spot concerns, I’ve been using The Ordinary Alpha Arbutin 2% which helps to lighten dark spots and brighten the complexion. I use a few drops of it and concentrate on my dark spots around my face. It’s important to note that you should be using sunscreen after using this product in the morning. Next, I use the Niacinamide 10% + Zinc 1% formula on my blemishes. Niacinamide, also known as Vitamin B3 helps to reduce the appearance of blemishes and the zinc in this formula helps to clear up the skin and control oil production. To seal in moisture, I have been using Tatcha’s Silk Cream. This is a pricey item, and I got it as part of a promotion Tatcha was running with their Essence. To be honest, while I like the product, I’m not sure I would pay full price for this product because the price is just a little too steep for what I am used to paying for moisturizer. Last step of skincare is of course, sunscreen. I’ve talked about this sunscreen in detail before – a favorite purchase from Taipei. Alright, that’s it for skincare. Next up is applying makeup. My latest favorite in primer and foundation is Hourglass. I first apply the No. 28 primer serum which is really a continuation of my skincare routine since it not only helps to prime my skin but seals in moisture at the same time. This formula might be intimidating since it is a rich oil serum. However, I find that in my environment, which is dry, this is actually a great formula to use because it absorbs very fast into my skin, does not leave an oily residue, and helps to keep my skin from feeling tight or dry. Next, I use the Hourglass Vanish stick foundation in the shade Shell, and apply it using the Vanish Seamless Finish Foundation brush. The way you use this stick foundation is by applying three triangles underneath your eyes, on your forehead and chin – and wherever else you need coverage, and blend using the brush. 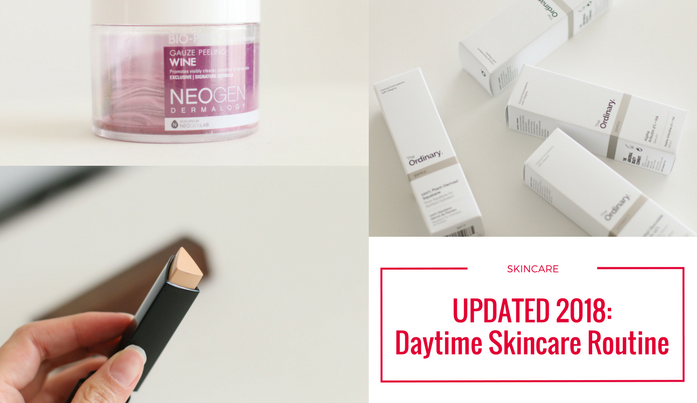 I discovered these products last year when I visited the Hourglass store in Abbot Kinney in Venice, but held off purchasing until recently because I hadn’t finished my previous foundation yet. I love how it blends into my skin, its match to my skin tone, and how natural it looks. It is buildable, and the stick formula allows me to control where and how I apply coverage. The “Precisely, my brow pencil” which is an ultra fine pencil. I’m using the shade Number 3 – “Medium” to lightly fill in my brows. And the 24 hour brow setter clear brow gel. I picked these two items up a couple of weeks ago since I needed a new brow pencil. I had been using Anastasia’s brow wiz pencils but the Sephora girl I talked to suggested I try Benefit’s pencil instead because the color is a little less ashy. I’ve been really happy with this pencil, how easy to use it is, and how it looks. Next, all you have to do is use the clear brow gel to set and keep the hairs in place. You can also use the gel at night to “train your brows” to grow in the direction that you want. For the face, all that is left to do is powder up and apply some light blush I’m using my favorite setting powder, which is RMK’s loose powder in the shade P00. For cheek color, I love Benefit’s Cheek Parade palette, which has 5 colors total for a great price – Dandelion, which is my day to day go to pink blush, and Hoola light, which is good light matte bronzer. I dust a mix of Galifornia and Rockateur, which adds a tiny amount of shimmer to my cheeks. To finish off my look, I use a black eyeliner pencil from Sephora which is about $12. I only really use liquid or gel liners for special occasions, but on weekdays I’m usually too lazy to use anything else besides a pencil. The price of this pencil is right and it also has a smudger on the other end, but I don’t really use it. Last step, I curl my lashes and call it a day!